It is with great regret that we have to announce that we have become temporarily unable to meet the demands of offering boat repair services in the City of Oxford. Until further notice we are having to withdraw ourselves from offering any services to new customers, until we are able to meet the demands of outstanding customers and ongoing projects. In the meantime we are endeavouring to keep up with existing projects with an emphasis on not letting anyone down by over-stretching ourselves. Partly, this is due to the fact we are unable to offer any out-of-water repair services in Oxford this year, although we hope to return to this once any opportunity to do so exists once more. Our preferred site at Salter’s Steamers boatyard near Donnington Bridge is not available due to their own commitments for the passenger boat fleet, which we all agree must be a priority for them. We’ve been fundraising and offering personal support to John Simmonds, who lost his home, the narrowboat One Old Peculier during a winter storm in February. For updates follow the One Old Peculier facebook page. We’ve also become heavily involved with fighting the council’s proposal to introduce an Oxford Waterways Public Space Protection Order, which will affect all potential users of the waterways in Oxford and is part of an ongoing attack by Oxford City Council against liveaboard boaters. This campaign against this poor legislation must be broader than boaters, and would benefit from your additional support. For updates follow the Say No to the PSPO facebook page. We’re aware that we have been pretty poor at social media recently, and equally as bad at responding to emails and phone calls, but we hope that this hiatus will enable us to come back stronger than ever before and continue our work supporting the boating community of Oxford and the wider waterways. Watch this space – Team GB. The Oxford Waterways Public Space Protection Order is a very sinister piece of legislation. As Green Boat Services we have been heavily involved in the campaign to prevent it becoming law. We have invested a lot of our time as a business so we feel we should share with our followers how it will affect the Oxford waterways, its residents, visiting boaters and ultimately the entire inland waterways and all of its users. For those of you new to the Anti-social Behaviour, Crime and Policing Act 2014, a PSPO is like an ASBO on a place rather than on a person. The nasty legislation allows for a single council official to create a criminal offence and then punish transgressors of this new offence. In summary: Oxford City Council are seeking powers to impose on the spot fines of £100 and potentially magistrate fines of £1,000 for what they deem to be anti-social behaviour across the entire waterways of Oxford. This proposal if passed will make it a criminal offence to moor a boat anywhere inside the ring road without prior permission (a right to public navigation exists on the River Thames dating back to the Magna Carta); for a boat to emit any noise or smoke (such as for heating or running engines to charge batteries); to store any items on the towpath (such as wheelbarrows, gangplanks, mooring pins); and could even apply to anyone with a dog off its lead or anyone with a can of beer. The intention is to dictate acceptable behaviour, and to chase those who disagree with their definitions (such as those who think lighting their stove in winter is reasonable!) out of Oxford. Once a notice is given, the options are to pay the fine, or argue the case at Magistrates Court, and risk a criminal record, potentially loss of professional qualifications, and a much larger fine. We cannot see this any way but as a punishment for being poor and living in a cheaper way in a very expensive city. Frankly, we believe Oxford City Council need to be held to account for ten years of anti-boater discrimination leading up to this. Combined with the underfunding of the Environment Agency and the persistent CRT campaign against liveaboard boaters, Oxford is a boating community on the edge. 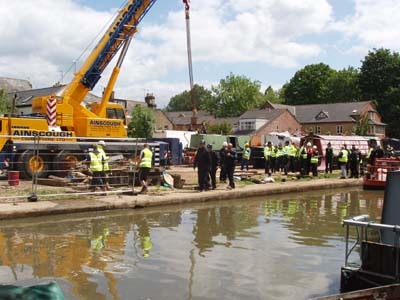 Even in the five years that we have been trading as Team GB we have witnessed an ongoing decline in the condition of moorings in Oxford, the riverbanks and canal walls are literally collapsing, moorings are being restricted with time limits if not entirely prevented, and charges are being imposed for moorings at sites all over the city. The dearth of moorings in Oxford continues apace, despite claims made by councillors that more would be created. At a time of extreme climate change and during the worst housing crisis in generations, it is becoming virtually impossible to live on board in the most affordable and environmentally friendly way that exists in Oxfordshire. In short, we’re doing everything our little bodies and brains can manage to fight this! Team GB have been involved since the beginning of the campaign, writing to and speaking at the council Scrutiny Committee meeting, writing to the City Executive Board, writing to and speaking at the Full Council meeting. We have been liaising with councillors, council staff, the National Bargee Travellers Association, Community Law Partnership, using our big list of contacts to put boaters in touch with other boaters, and we’ve been proud of what our friends/customers/neighbours have been pulling together to achieve. It’s ongoing and could be for months yet! Write to councillors – all of them! This is a difficult and emotional post for Team GB. 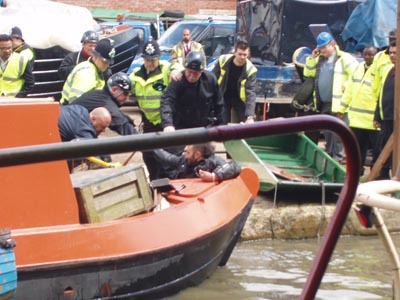 Today is the ten year anniversary of the final eviction of Jericho Boatyard which has never been replaced despite all stated intentions. 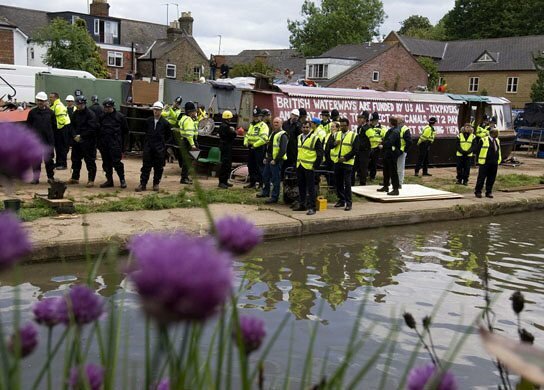 The closure of the last remaining public boat repair facility in Oxford is directly linked to the current allegations of antisocial behaviour of people living on boats. Each of these issues could be solved by the provision of a permanent facility in Oxford. Complaining about badly maintained boats while a boat yard stands empty for ten years in the heart of the city so that residents have nowhere to maintain those boats is adding insult to injury. The Oxford City Councillors responsible for overseeing the Jericho Boatyard saga, Suzanna Pressel and Colin Cook, have each spoken out strongly in favour of a final solution to these issues involving the criminalisation of everyday boating behaviours. These councillors representing the citizens of Jericho and Osney, which includes dozens of permanent and hundreds of transient boats, are the exact same councillors who have established and supported the Unlawfully Moored Boats Enforcement Group, a secretive unaccountable committee involving navigation authorities and the police promoting the removal of unwanted liveaboard boats from inside the city. Boats are homes and must be maintained to safe standards, Oxford City Council has conspired against boaters to deny them even basic services for over a decade. From the 1790s bargemen and wharfmen working the Oxford canal were an integral feature of city life. In the 1890s, North Oxford locals paid for the building of St Margaret’s Institute – providing baths and books for wharfmen. Today, in the heart of Oxford, boaters have no choice but to live without supporting resources and are forced into a fight for self-sufficiency simply to survive. This is a dark day of remembrance for us, continuing a dark time for Oxford boaters. 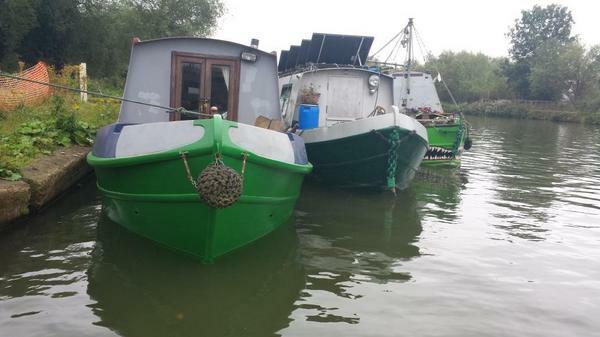 So 2015 has been another busy year for Green Boats. New records were set in the slipway; more boats, more staff, more painting and especially more epoxy than ever before. We filled every slot that we had during our time available and bar a couple of exceptions all the launching and relaunching was done on time giving plenty of notice and making life easier for our hosts, Salter’s Steamers. Our ever widening customer base is bringing us new and interesting work as well as new and interesting friends. Thanks this year to our very good friends on the beautiful wide beam boats Odin IV and Wychcraft, who came days upstream to us all the way from Bourne End Marina, Bucks, for shiny new epoxy bottoms. And special thanks to @NB_Coqui for the loan of an actual green boat, their tender Sapo, with a fabulous little electric motor, which was both incredibly useful and fantastic fun. We had a nice autumnal treat relocating a boat from Brentford to Oxford, which we documented some of with timelapse video available on our new YouTube channel. 2015 has sadly also been a year of bereavements for us, including the loss of elderly official Green Boats dog Yoric. 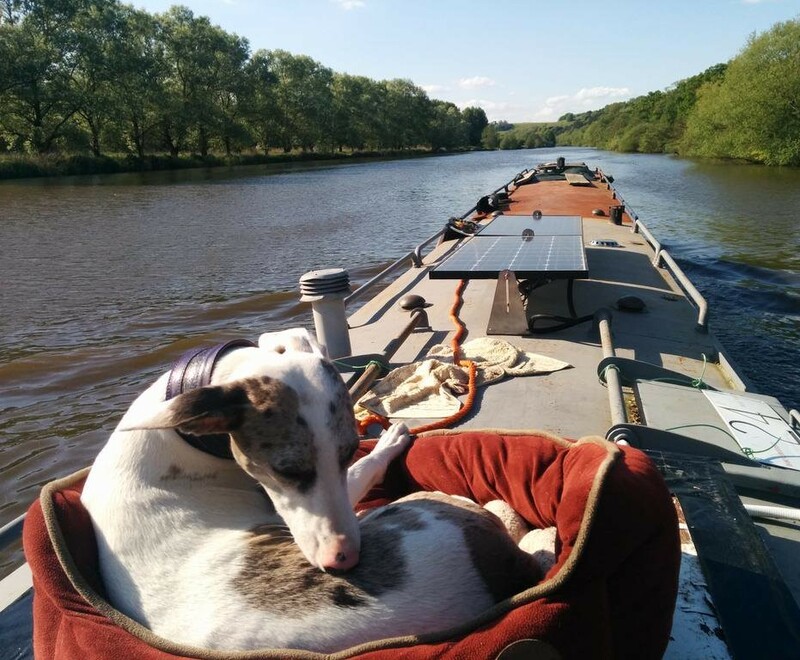 Kara is still learning to fill his role, she is certainly very relaxed about boating. As many of you know, we mostly shut down over the winter in order to focus on large projects and because hypothermia often offends. This year the primary focus will be Pirate Princess, an ex-community boat of the Pirate Club in London, now in private hands and having a major systems refit. We will be available for emergency callouts and potentially for tea-fuelled planning sessions for projects for 2016. We do not yet have dates for the 2016 slipway season, these are likely to be available in the spring. However, we already have a couple of boats on the waiting list, and we are happy to add you to it. Have a safe winter, and get some icicle cruising in if conditions allow. It is worth the potential frostbite for the views, but DO STAY SAFE! If you do need us in an emergency, we have pumps and generators available at short notice and can assist with most domestic engineering/electrical/plumbing/heating incidents that might otherwise spoil your boat-lives. For £150 we will attend within 2 hours with necessary equipment and supplies and provide up to two hours labour, available in Oxford, Abingdon, Kidlington or anywhere in between. PS. IT’S NOT GOING TO FLOOD!!! So we have reached the end of the first month in the slipway, and we have survived this far! We have blacked four boats, plated one, epoxied one and are in the process of epoxying a second, not to mention cabin painting for yet another. We have had a lovely range of boats so far this year, from a teeny tiny Springer to a town class Harland and Wolff. This week is our youngest boat, a rather cracking 3 year old Aintree Boat, and next week our oldest boat of the year, the venerable Joey boat Mafeking, well over 100 years old. I am very happy to say these have both opted for epoxy paint, although disappointed that neither could be persuaded into a coloured top-coat. There have been many discussions about longevity of epoxy paints, Jotun estimate a 10 year life if correctly applied. We haven’t been using it long enough to be definitive, but but we can assure you that it is considerably longer lasting than bitumen! 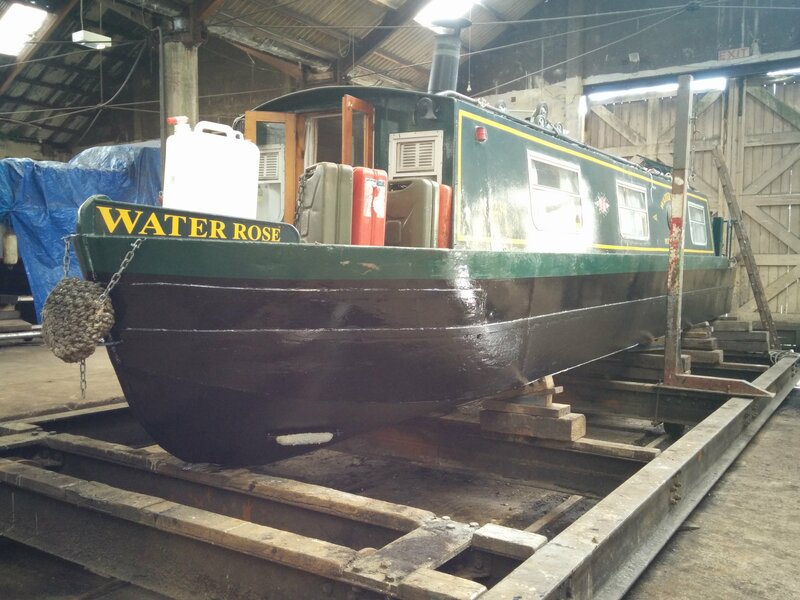 We definitely rate it – all three of our own boats have now had their years of bitumen removed, and epoxy applied. Back to this season, we have some really great enthusiastic staff, including a very handy new woodworker, and Jon and I are really enjoying the team. Sadly, the official Team GB dogs are something of a trial this year, poor old @IIzYoric hasn’t been very well, and mischievous young @Kara_TAP has been maintaining her reputation as the escapuppy. But they are vital in terms of team morale, and they do give the customers an extravagant welcome! As ever, we aim to be your one-stop-shop for boating maintenance needs. Get in contact if we can help, and if you do want to come out of the water this year, let me know ASAP. A few slots left, but filling fast. The sun is shining and the boating season is underway! We are delighted to announce that we are back in the slipway from 1st June. Another late start this season and a waiting list that started last year has me very busy juggling trolleys and boats and ordering bitumen by the lake-full. We are not yet fully booked, but now is the time to contact us if you would like to discuss surveys, steelwork, blacking, epoxy, antifouling or any other out-of-water work. Before we start in the slip, we are already busy with the usual little breakdowns of the beginning of the season and with the many of our customers who seem to have BSCs due. We are glad to see that some of you are also booking an annual engine service. If you haven’t already done so, get that oil and those filters changed, get those tappets checked! Your engine will thank you for it… Give us a call if you’d like us to schedule your service. We have also had a wonderful time with a major electrical overhaul for a returning customer, including 5 new bespoke fully adjustable solar panels. She now has more power than she can use, which entirely makes up for our traditional day spent on the solar installation in the rain. Electrics are always Jon’s first love, and our solar panel installations are very slick now. They are such a great investment, Element has had them since my first spring aboard her and they still seem like magic free power! Remember we are on Twitter and Facebook; send us photos of you adventures, we like to hear from you! Springtime is here and the weather’s getting warmer! We’ll all be out boating soon! 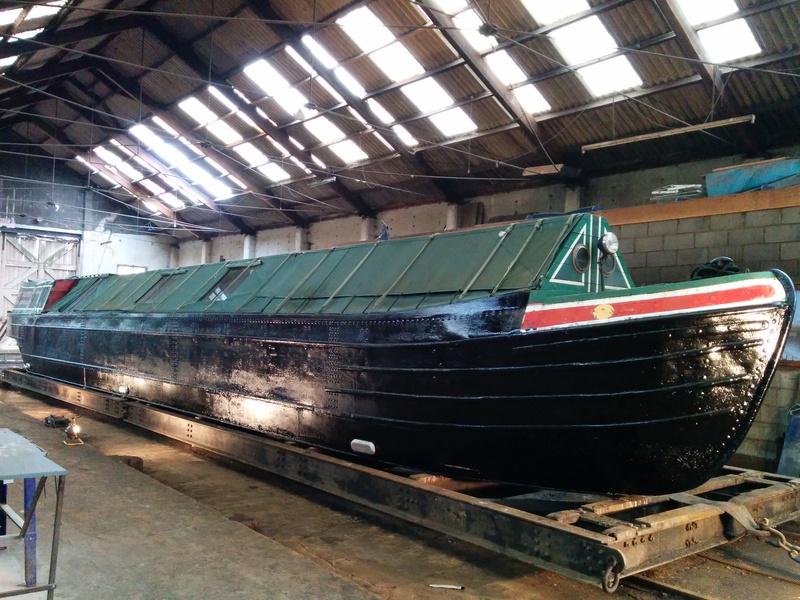 Having failed to secure the use of the EA dry dock at Osney over the winter we’re looking forward to going back into Salter’s Steamers slipway in Oxford as soon as we’re able to. Unfortunately this might not be available until June and already we have a large list of customers hoping for us to work on their boats. It’s going to be another busy summer! Phew what a busy year! We haven’t been able to update the website as much as we’d like, but you can still follow our adventures on twitter and facebook. The weather’s worsening and the river is rising. Things are having to slow down for us through the dark days. We’re still around in Oxford though, and not giving up just yet. We hope to have some brilliant news to bring you in the springtime. In the meantime don’t forget you can view all the work we’ve been doing through the summer this year on our flickr site. If you have a problem… if no one else can help… and if you can find them… maybe you can hire… The GB Team. This month has a lot going on with Team GB. On 7th June is the Blenheim Triathlon, where you will find us cheering on Helen Ody, who is fundraising for Leukaemia & Lymphoma Research, a cause close to our heart. Do join us if you can. That may be our last jolly of the season, as we are also starting in the slipway this month. So far we have blacking, antifouling, painting, broken bow thrusters and dodgy electrics to look forward to. Whatever your boat needs, should you wish to add to our summer of boat-mending fun, just get in contact and we’ll look forward to sorting your boat out too! As ever, we will be tweeting our adventures whenever we have the energy and the time. We also put up before and after photographs on our Flickr account. Team GB are enjoying this fine May weather and we hope some of you are getting out and about boating! The recent spate of red boards should remind us all that this river is a temperamental beast, do take care and wear life jackets on the river, especially if you are single-handing. We have been enjoying a nice spate of electrical jobs, and it looks like we are going to be doing some more boat moving this year! We have also been working on several interesting plumbing and water heating options. We still plan to be in the slipway this summer, we have several boats already booked in, but we do still have spaces. Do contact us if you need a survey, blacking or antifouling. A little steelwork might be fun too!